79360 Sila-Nunam was discovered exactly eighteen years ago at Mauna Kea, Hawaii, by Jane X. Luu, David C. Jewitt, Chad Trujillo, and Jun Chen. 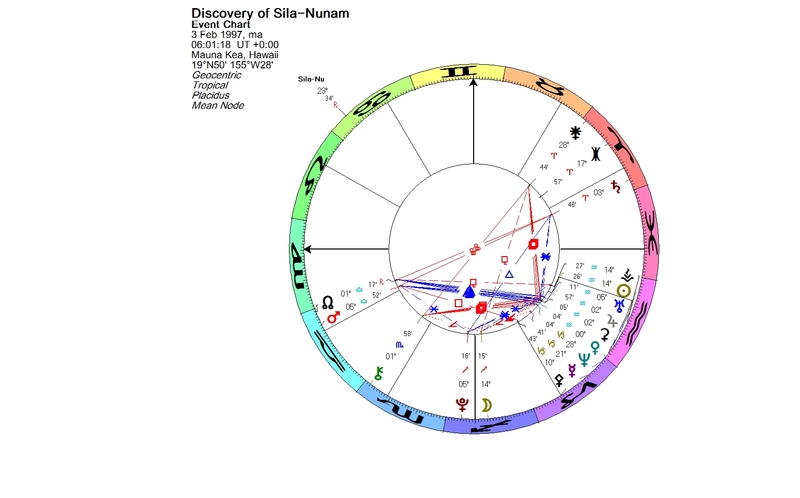 Yesterday’s Full Moon in Leo was in conjunction with Jupiter and Sila-Nunam. The principle of Jupiter is growth and expansion. If Jupiter touches another planet in the chart by an aspect, the effect of that other planet tends to expand. Sila-Nunam is a so-called cubewano, a classical Kuiper belt object with an orbital period of little over 291 years. It is a binary system. The two components are so close in size that they may be thought of as a double cubewano. The naming of the system took place three years ago, in January 2012. All classical trans-Neptunian objects are given mythological names associated with creation. Sila and Nunam are Inuit deities. Sila is the Inuit god of the sky, weather, and life force. Nunam is the Earth goddess, Sila’s wife. Nunam created the land animals and, in some traditions, the Inuit people. Sila breathed life into the Inuit. Sila or Silla is one of the oldest Inuit deities, even older than Sedna. He is thought to be formless and not to have many personality characteristics. Maybe that is why it is not easy to get grasp of the astrological meaning of this object named after him. As Silla is a deity of the sky, the wind, and weather, Sila-Nunam could possibly be used as one of the weather asteroids. I think the meaning should go deeper though than just an occasional winter storm or a snowfall, because Silla was a mighty creation god. The Inuit believed that Silla was the primary component of everything that exists. He had control over everything in one’s life. The global weather on planet Earth is changing. The global warming affects us all: people, as well as animals and plants. In 1997, the same year when Sila-Nunam was discovered, an international treaty known as the Kyoto Protocol was adopted. The agreement set targets for industrialized countries to cut their greenhouse gas emissions. The agreement entered into force in 2005.The Protocol’s first commitment period started in 2008 and ended in 2012. Many scientists say that the targets set in Kiyoto are too low. The global warming cannot be stopped anymore. Oil and gas production is the major source of greenhouse gas emissions. Planet Neptune and the Pisces sign are the astrological indicators of oil, gas, and oil fields. 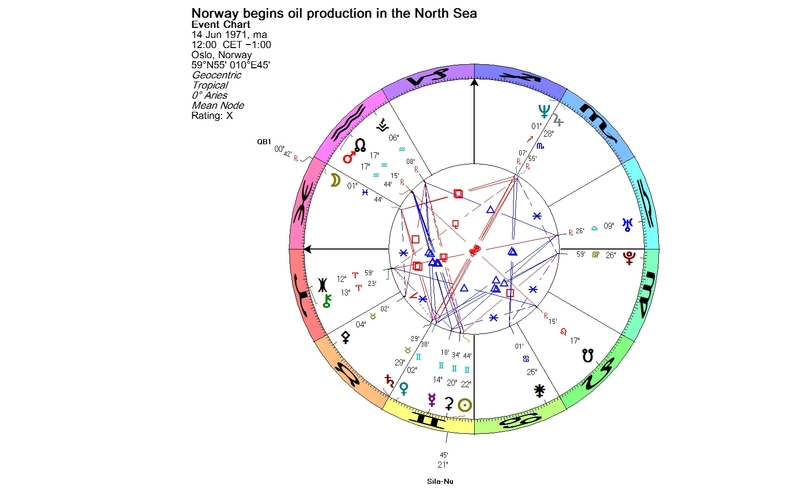 When Norway began oil production in the North Sea on June 14, 1971, Jupiter (the magnifier) was in conjunction with Neptune. 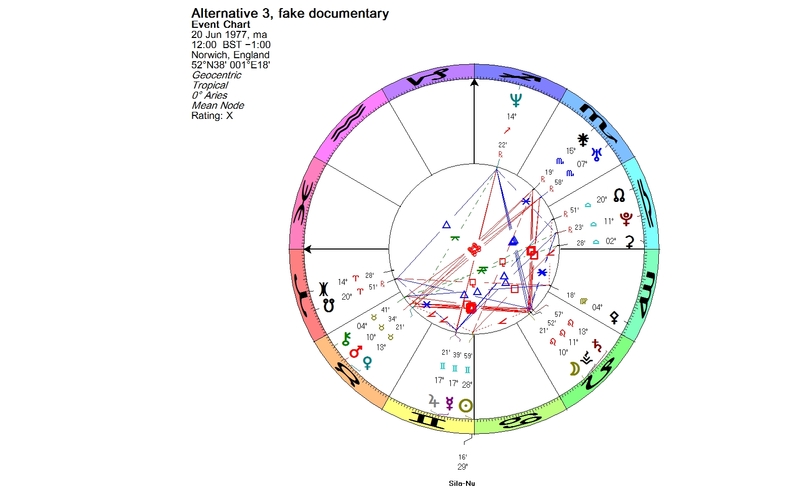 1992 QB1 (the trailblazer) had entered Pisces a few months earlier and was in the first degree of the sign, where the energy is fresh. The Sun was in conjunction with Sila-Nunam. Today big oil companies are racing towards the Arctic, the region where the Inuit live. The Arctic holds some of the world’s largest unexploited oil reserves. Arctic oil drilling could have disastrous effects on the vulnerable environment and on the global climate. The risk is too high, as the spill cleanup is impossible in icy conditions. On June 20, 1977, the Sun made its yearly conjunction to Sila-Nunam. Anglia Television in the United Kingdom broadcast a fictional documentary known as Alternative 3. The public’s reaction was almost similar as to Orson Welles’s famous radio drama in 1938. Anglia Television was flooded with telephone calls demanding more information. The episode had begun by reporting mysterious disappearances of physicists, engineers and astronomers. According to the research presented in the programme, the missing scientists were involved in a secret plan in outer space. The scientists had determined that the Earth was not able to support life for much longer, due to pollution which was causing a catastrophic climate change. There were three alternatives to the problem. The first one was a reduction of the human population. The second was to construct vast underground shelters for people until the climate would be stabilized. The third alternative was to populate Mars via a way station on the Moon. In reality there is no Alternative 3. Our best option is to reduce pollution. The global warming may not be stopped, but it can be delayed. We need to conserve the life force of the Earth. 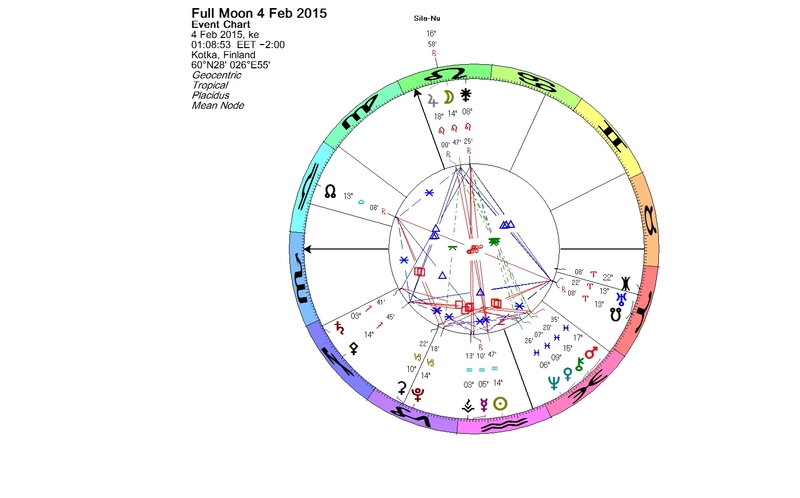 This entry was posted on Wednesday, February 4th, 2015 at 11:44 pm	and is filed under Full Moon. You can follow any responses to this entry through the RSS 2.0 feed. You can leave a response, or trackback from your own site.